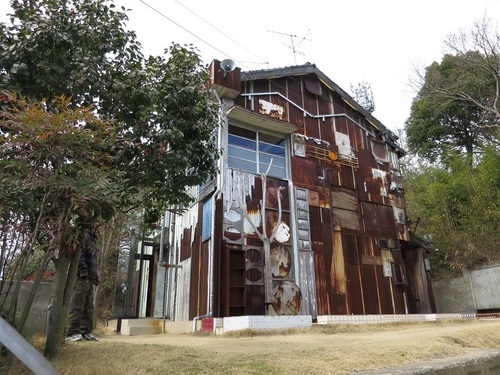 ‘Naoshima’ in Kagawa Prefecture, a small island in ‘Seto Inland Sea’, is a treasury of installation arts. 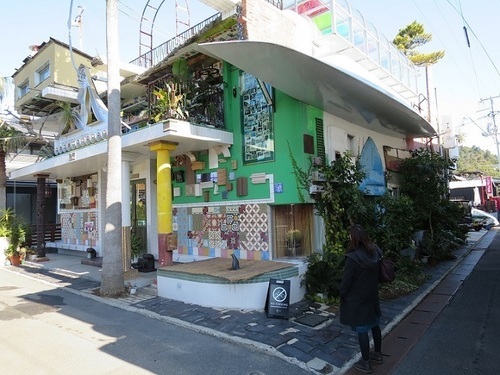 An art project, what is called ‘ie-Project’, was started in ‘Honmura’ district in 1997, where is one of the oldest residential areas on this island. This project was triggered by Mr. Soichiro Fukutake, a well-known businessman in the field of education, and seven core artists participated centering on Mr. Tadao Ando, a world figure. They turned old empty houses into works of art with artistic exterior/interior design. The 300 year old townscape, dotted with the seven intallation arts, should be called one big installation. This ie-Project is specifically made up of ‘Kadoya’, ‘Minami-dera’, ‘Kinza’, ‘Go-o Shrine’, ‘Ishibashi’, ‘Gokaisho’ and ‘Haisha’ as shown in the first picture. This project aside, a bathhouse named ‘Airabu-yu’, standing close to ‘Miya-ura’ port, the main gateway to Naoshima, is one more installation on this island. As shown in the second picture, this is a newly-built bathhouse and is actually used by the locals and visitors for the place of exchange. The interior/exterior materials were from everywhere in Japan.